During its 30 Years of Gaming and Graphics event on Saturday, AMD announced the Radeon R9 285, the newest addition to the company’s lineup of desktop graphics cards. As noted by Tom’s Hardware, the Radeon R9 285 is very likely based around AMD’s new Tonga Pro GPU, though the company played coy regarding the specifics during the official announcement. The board features a clock speed of 918MHz, and a 2GB of GDDR5 memory clocked at a speed of 5.5Gbps. Put it all together and you have a board that can deliver up to 3.29 teraFLOPS of computing performance. 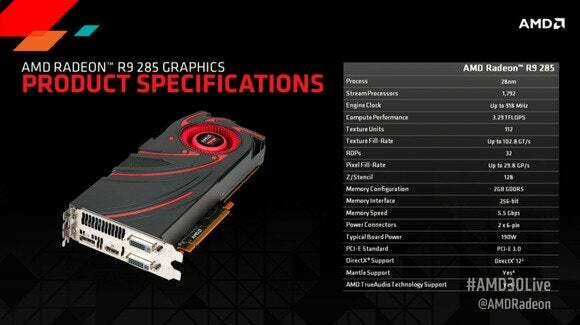 Specs for AMD's Radeon R9 285 graphics card (click to enlarge). AMD touts the R9 285 as being faster than the Nvidia GTX 760, and says that it “designed it for a single purpose: to play demanding PC games at maximum detail better than any card in its class.” We’ll have to wait and see if AMD’s claims hold up in the real world, though. The Radeon R9 will be available for purchase on September 2nd, and it’ll set you back $249. This article was updated on 8/25/14 with additional details.